Our company shares glorious credentials with the eminent Manufacturers, Suppliers and Exporters of Hydraulic Dab Press Machines. 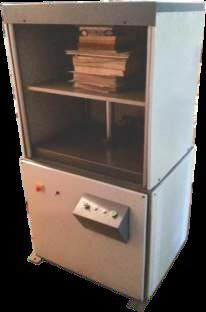 It is designed for pressing of hard case bound books soon after casing and joint forming process. The pneumatically controlled pressure results in faster production and better efficiency. When it comes to bulk orders of the Pres Machines, you can completely rely on us. One can obtain the Machine at nominal rates.